Now that glorious weather has finally graced the city of Boston with its presence, there’s really no good excuse to stay inside. Oh, wait! You have to work? We forgot that small detail. But for the legions of unemployed individuals who spend their days stalking Craigslist and Monster.com for open positions, searching for a job might just become a little more pleasant. There are a variety of Boston parks that provide wireless internet, which means you can perfect those cover letters while lounging on a towel under a tree with a Bug Gulp in hand. The WiFi may not always be reliable, but neither is stealing it from your landlord. The North End’s Christopher Columbus Park is the perfect location: The old world charm of Italy with outstanding waterfront views. The scenery is a lot more than your local grassy knoll though; you’ll see everything ranging from rose gardens to elaborate fountains spurting water at children. With an expansive playground to climb on, this is definitely a family friendly park. If you have to get some work done on your laptop, bring the kids along. Also, if you want to log on during your mid-day break from your own laptop, this is an extremely popular area with the lunch hour crowd. With gourmet coffee shops around every corner, you can caffeinate your way to a productive day in the park. 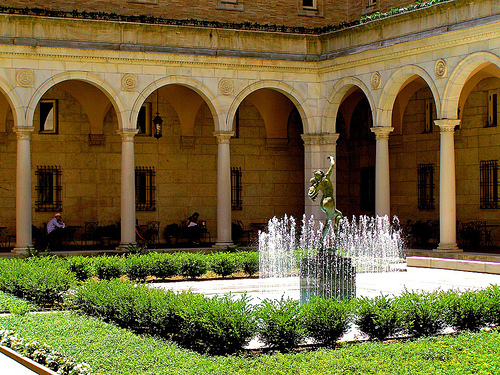 If you’re really looking to get some work done, the Boston Public Library’s courtyard boasts extremely reliable WiFi. Besides having world-renowned architecture surrounding you, you also have one of the country’s best literary collections right at your fingertips. The BPL won the Boston Phoenix’s “Best Spot for WiFi” in 2009, so the connection is definitely reliable. You can always run inside to recharge your battery, but be sure you hold a Boston Public Library card, because you won’t be able to log on without one. The concrete jungle known as the Financial District is usually stocked with men in business suits rather than tee shirts and sneakers. However, the Norman B. Leventhal Park in Post Office Square is a little oasis in the middle of urban chaos. This park actually used to be an unsightly parking garage, but it was revitalized into a beautiful, tech-friendly landscape. The wireless in Leventhal Park is known to be extremely reliable, so you don’t have to waste an hour walking around trying to find a wireless signal. Also, there’s a café with coffee and baked goods, as well a cart that allows people to borrow seat cushions from 11am to 2pm in the summer. Seeing as we spend so much time complaining about Boston weather, we need to take advantage of the rare instances when it shows its true New England beauty. A contributing writer for DirectoryofBoston.com, Megan Johnson is originally from Connecticut, but has lived in Boston since age 18. She regularly contributes to MenuPages Boston, Butterfly Diary, SweetTalk on the Spot, Reinventing Beauty Magazine, and a variety of other publications. You can visit her website at www.meganjohnson.tumblr.com. One slight correction about the Boston Public Library wifi. You don’t need a library card to access the filtered wireless access (which blocks out graphic sexual imagery). You only need a library card to obtain full, unfiltered wireless access. .-= Michael C.´s last blog ..Why I love Batwoman =-. « Sowa Open Market Super-Sized this Sunday!